Does your team need design leadership to take their project to the next level? A Unicorn Rescue isn't staff augmentation or a run-of-the-mill contract assignment. It's a design sprint on crack. Our design-thinking SWAT team—a crew of director- and senior-level creatives who'll join your squad for one week (or more! )—will level-up both your project and your team with a mixture of business analysis and user research all the way to information architecture and high-fidelity visual design. 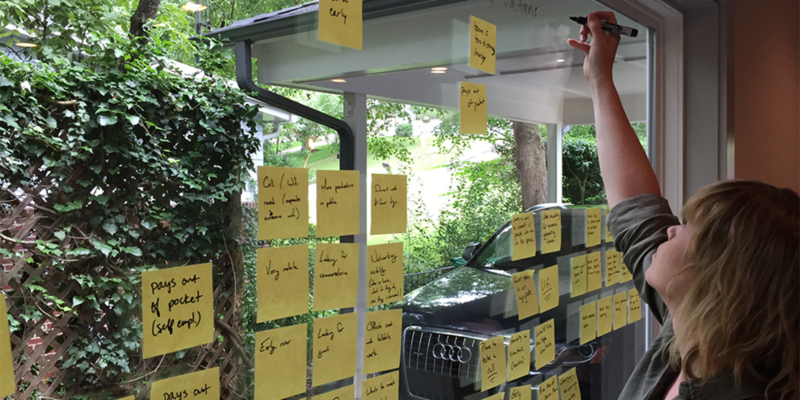 J+E's design unicorns synthesize raw user research using affinity mapping to find themes among qualitative data. In a typical one-week Unicorn Rescue engagement, our designers, consultants, and seasoned instructors work with your stakeholders and team on a single key project, either at your office, in your user's environment, or in a creative and convenient off-site location. And whether your team is made up of designers or members from other disciplines, we'll tailor our approach and our materials to demonstrate effective user-centered design principles and processes you can start using right away, and keep using once we're gone. To make sure we're tackling the right problems, we'll kick things off with a detailed look at your project, the competition, and comparable solutions. We'll find and start talking to your users. And with the data they provide, we'll identify their most important needs, pain-points, and opportunities to make an impact. Based on our user and business research, we'll make sense of the complex tasks, interfaces, layouts, and content users will navigate when using your solution. Our iterative-design process will advance to visual design, interaction design, and content development, raising the fidelity of your solution to something testable and codeable. We'll close by building prototypes and testing them with real users for real feedback. We'll also package up all our deliverables so you can keep going. This schedule is an example—the exact services and deliverables will vary by engagement and team. The team at Block and Tackle have each launched their fair share of big projects over the years and are no strangers to process. With Post-Office, their soon-to-launch roving pop-up coworking space concept, they wanted to build it as intelligently as possible. So, they did what they tell their own clients to do all the time: They called in the experts at J+E. Getting to start from scratch with a new consumer product is just about every designer's dream. And with our one-week Unicorn Rescue program, we got started tackling business analysis and research all the way to user flows and design. A typical one-week Unicorn Rescue engagement costs $15,000 and includes JD and team on a full-time engagement (Monday through Friday, 9:30am-4:30pm) as well as any design deliverables and related licenses produced during the course of the week. Half of the fee will be due on agreement of terms as a deposit—the remainder upon completion of the scheduled Unicorn Rescue week. Travel and travel-related expenses outside of the Atlanta area, project-specific materials, and additional resources may cost extra. We're comfortable working under reasonable NDAs and are willing to consider longer engagements if your project needs more love and if your team wants more design expertise—let us know what you have in mind and we'll work something out.